Chronic antipsychotic lipitor 10mg cost ireland treatment should generally be reserved for patients who.. Stage Special vice type mechanical stage to accommodate objects of small diameter. Special replacable attachment is also provided to hold materials like notes, cartoons, stamps, finger prints etc. Objective 5x, 10x and 45x Achromatic. Eyepiece WF 10x, H15x, H10x Micro & H5x cross. Stage Circular rotatable stage, 130mm dia, graduated through 360-degrees with vernier reading to 1 degree. Also provided with Polariser and analyser, Bertrand lens, 1/4 wave length Retarding plate, Gypsum and Mica plates. Objective PO 5x, PO 10x and PO 45x Achromatic. 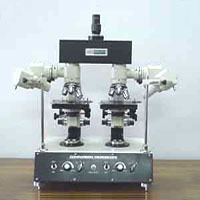 Observation Head This microscope has been designed for quality control, to compare the standard sample with the one in production. It is a multi-integral precision instrument of high performance of fullest versatility for visual observation.